A Power of Attorney is an essential safety net for aging individuals and their families. Read on to learn what it is and how it works. Only about two out of every five people from the ages of twenty-two to thirty-seven have a power of attorney (POA). This number increases with age: approximately 83% of people over 72 have a power of attorney in place. 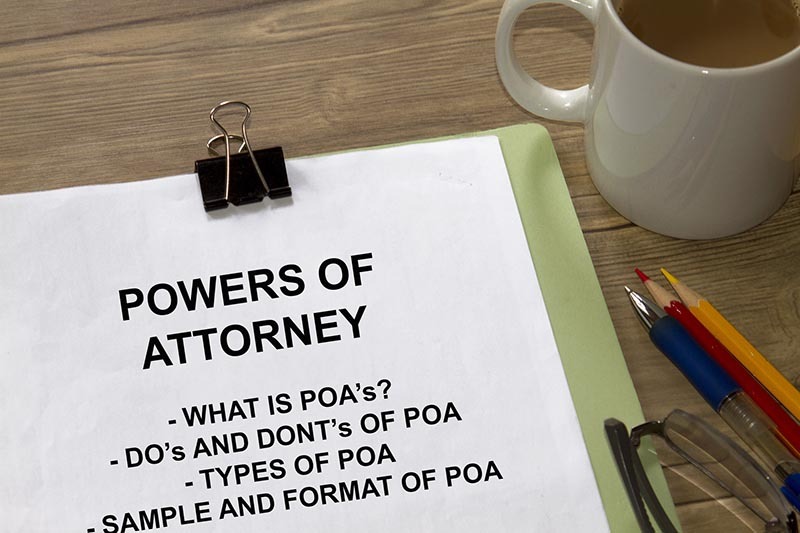 But do most of you even know what a power of attorney is? Many people think that because they have a Last Will and Testament, they have a Power of Attorney. They do not. A Power of Attorney is one of three documents that are prepared during the Estate Planning process, the three being a Power or Attorney, A Personal Directive; and a a Last Will & Testament. Each document is independent of the other, each are very powerful; and may have different agents listed in each. What is a Power of Attorney; and, What Are The Types of Power Of Attorney? A power of attorney allows you to appoint a person of your liking to do a specific job. This person becomes your agent or "attorney in fact." It is their job to act in your place for fiscal purposes or other reasons if there is ever a time--God forbid-- when you cannot make business or financial decisions on your own behalf. Examples of when this could be needed: if you get Alzheimer's, Dementia, if you go into a coma, if something terrible happens during your every day and limits your ability to think things all the way through (i.e., construction or car accident). An enduring power of attorney is a person to act on your behalf. As it says in the name, the broad power attorney gives a person a broad amount of power, and these powers can include: settling claims, making financial and material gifts from your money, employing professional help, operating within your business interests, helping with your properties, and handling financial and business transactions; and, dealing with the Canadian Revenue Agency. These are generally used when someone is physically or mentally unable to handle their own state of affairs. Or it could be something as small as this person is out of the country, and needs someone on the ground helping them handle their personal affairs at home. Usually, if you have the financial means for an estate plan, you already have one of these lined up. The Enduring Power of Attorney will remain in charge as your agent until you wake up from your incapacitation or until death. You should appoint both a Primary Agent and an Alternate Agent in case the primary agent dies, becomes incapacitated and is unable to act; or, simply refuses to act. This most likely goes without saying--considering that it has already been mentioned that a power of attorney can decide what to do with your life and your finances--but a power of attorney is a very open document. It allows you to give someone as much or as little power as needed. Limited POAs are often used for singular transactions. For example, you are selling your lake house, but you will be out of town, so you give your friend limited power to do it for one day. People also use Limited POAs to trust people with their businesses as well. This can be highly beneficial because it can allow someone who knows your business to sign contracts for you, meet with investors, and do other important things among your trade. However, this is most definitely the type of power of attorney that legal advice would be highly recommended. Out of all things people need advice for, Contract law can often be one of the most beneficial due to how attached people seem to be with both their money and businesses. Having a limited POA can come with many benefits. But make sure to choose someone in your personal or professional life that you can trust. An Enduring Power of Attorney also comes into effect when a triggering event occurs. Most triggering events are simply a medical doctor licensed to practice in the donor's jurisdiction, signing a Medical Direction stating that the Donor in incapacitated. The Power of Attorney along with the Declaration is then forwarded to the recipients requiring the documents. It is better to have the documents notarized as true copies, which most lawyers offices can do as Notary Publics and have the true copies delivered to the recipients, rather than sending out the originals. An immediate power of attorney comes into effect as soon as it is signed and remains in effect notwithstanding medical incapacity. It is similar to an Enduring Power of Attorney and can be modified or retracted prior to mental incapacity. If you are going to use this type of POA, it is critical that everything is crystal clear in the document you are planning on using for the specifications; this is much more so important if you own any of your own property or businesses. Yeah, But Do I Really Need a Power of Attorney? I am only 18 years old and have no real net worth. Imagine if someone very close to you has a stroke. 1 in 4 Canadian have a stroke under the age of 65; we have seen many people in their 20's, 30's and 40's have strokes. It could be anyone: your daughter, your son, your husband, your sister, maybe, even your best friend. They do not have a power of attorney, and guess what? Disability Insurers start asking for a copy of the power of attorney, the banks want copies, lenders want copies, the Canada Revenue Agency wants copies. A spouse does not have an automatic right to sign papers for their spouse. Neither does a parent have a right to sign for their adult children, nor do adult children have a right to sign for their parents. Without a Power of Attorney and Personal Directive, someone needs to be appointed by the Surrogate Court of Alberta under the Adult Guardianship and Trusteeship Act. This process can cost up to $10,000.00 and take several months before and order is granted. It is a horrible and expensive process. With a Power of Attorney and Personal Directive all you need to do is gather your documents, get the doctor's declarations signed, have them notarized and have them sent out. Well, it already looks like you are taking that step into account. But seriously, talk to experts, go online, make yourself a pros and cons list, and make sure to come with a list of questions before talking to the person you choose and any legal advisors. Choosing someone can be tricky for some of us and easier for others. Maybe it is your spouse. Well, that was easy, but this decision should come with some serious contemplation. Is this person trustworthy? Do they live relatively close to you or can they be physically close to you in a short amount of time if needed? Are they themselves in good health? Notaries, witnesses, a safe place to keep these documents: you are going to need it all. So make sure that you are paying attention to these little details as you go. Remember to ask the person you are choosing if they are willing to act on your behalf. Also, consider asking for an alternate (or backup) agent in the power of attorney. You can also elect to name people jointly; however, if they cannot agree, one can deadlock the other and they will need to hire lawyers to bring an application before a judge to determine how to break the deadlock. Your lawyer should also keep a copy of the original power of attorney; and, they should make a note in your file where it will be stored. Many people choose fire resistant personal safes or lock boxes. It should be noted that in the devastating Fort McMurray and Slave Lake Wildfires, that none of these boxes survived a complete burn down of the property. Safety Deposit Boxes are the best places to store your estate planning documents for two reasons: 1. They are the most fire and flood resistant; and, 2. They are often the first place people go to look for important documents. Life is complicated. Do not make your final life's decisions a guessing game for you or your loved ones. It is easier for our estate lawyers to deal with a situation where there is no Last Will and Testament than it is for us to deal with a Dependent Adult that does not have a Power of Attorney. The confusion, the agony and distress the loved ones go through is heartbreaking. The relief on their faces when we pull out a signed Power of Attorney is amazing. We cannot stress enough at how important they are. No matter what your age is, go out today, and start working on your power of attorney. Questions or comments? We have completed 1000's of Estate Planning Appointments for people just like you......Please feel free to contact us! This entry was posted in power of attorney by verhaeghelaw. Bookmark the permalink.